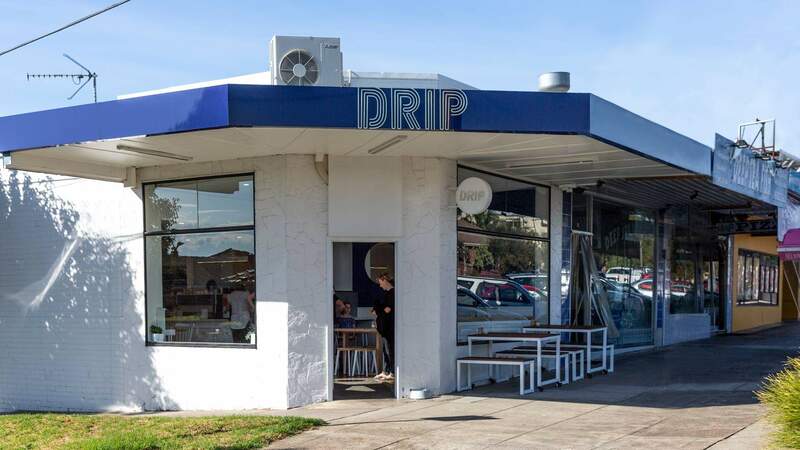 Offering a much-needed coffee spot for the suburb of Cheltenham, Drip Cafe is serving up all your brunch favourites with a touch of Middle Eastern flair. The food is inspired by the Lebanese heritage of owners Ali and Hannah El-Halabi. This husband-and-wife duo is all too familiar with the Melbourne cafe scene, too, having been running Bentleigh East's Poncho Cafe for over five years. Located on what was once a quiet strip of takeaway shops, this modern and playful corner cafe has brought life to a residential bite of the southeastern suburbs. Designed by Elvin Tan, the interior has been transformed with azure blues and crisp whites to create a vibrant, brightly lit space. Having been open just shy of three weeks, the venue's most popular dish to date is the decadent Knafeh French Toast, a menu item Hannah says was a culinary risk that paid off. "Our french toast is inspired by the Lebanese dessert knafeh: a cornflake-crumbed brioche filled with semolina custard and topped with rose water syrup," says Hannah. "My husband told me I was crazy and it wouldn't work — yet here we are." Other beautifully plated, Lebanese-inspired dishes on the menu include the spiced freekeh and lamb salad, veggie patch bowl and orange blossom hotcakes, which are served with caramelised orange and cream — and inspired by the gifts the El-Halabi's relatives send from overseas. "Every Lebanese household cooks with rose water and orange blossom, " says Hannah. "Our friends and family send them from overseas as gifts, and when you visit Lebanon, you always bring some home. Our mums have always used them in our cooking, so it made sense that we did, too." With high-quality coffee a passion of both the Drip Cafe owners and staff, you can expect perfectly crafted cups of joe on Inglewood Coffee Roasters beans, as well as single origin and batch brews. Don't let the cooler weather deter you from visiting Drip Cafe, either, the sunny outside dining area will soon be transformed into a covered courtyard for winter. And this spot is dog-friendly — perfect for both two- and four-legged brunch enthusiasts.